I dreamt that I had done a horrible thing, so that burial was to be denied me either in soil or sea, neither could there be any hell for me. I waited for some hours, knowing this. Then my friends came for me, and slew me secretly and with ancient rite, and lit great tapers, and carried me away. It was all in London that the thing was done, and they went furtively at dead of night along grey streets and among mean houses until they came to the river. And the river and the tide of the sea were grappling with one another between the mud-banks, and both of them were black and full of lights. A sudden wonder came in to the eyes of each, as my friends came near to them with their glaring tapers. All these things I saw as they carried me dead and stiffening, for my soul was still among my bones, because there was no hell for it, and because Christian burial was denied me. They took me down a stairway that was green with slimy things, and so came slowly to the terrible mud. There, in the territory of forsaken things, they dug a shallow grave. When they had finished they laid me in the grave, and suddenly they cast their tapers to the river. And when the water had quenched the flaring lights the tapers looked pale and small as they bobbed upon the tide, and at once the glamour of the calamity was gone, and I noticed then the approach of the huge dawn; and my friends cast their cloaks over their faces, and the solemn procession was turned into many fugitives that furtively stole away. Then the mud came back wearily and covered all but my face. There I lay alone with quite forgotten things, with drifting things that the tides will take no farther, with useless things and lost things, and with the horrible unnatural bricks that are neither stone nor soil. I was rid of feeling, because I had been killed, but perception and thought were in my unhappy soul. The dawn widened, and I saw the desolate houses that crowded the marge of the river, and their dead windows peered into my dead eyes, windows with bales behind them instead of human souls. I grew so weary looking at these forlorn things that I wanted to cry out, but could not, because I was dead. Then I knew, as I had never known before, that for all the years that herd of desolate houses had wanted to cry out too, but, being dead, were dumb. And I knew then that it had yet been well with the forgotten drifting things if they had wept, but they were eyeless and without life. And I, too, tried to weep, but there were no tears in my dead eyes. And I knew then that the river might have cared for us, might have caressed us, might have sung to us, but he swept broadly onwards, thinking of nothing but the princely ships. At last the tide did what the river would not, and came and covered me over, and my soul had rest in the green water, and rejoiced and believed that it had the Burial of the Sea. But with the ebb the water fell again, and left me alone again with the callous mud among the forgotten things that drift no more, and with the sight of all those desolate houses, and with the knowledge among all of us that each was dead. In the mournful wall behind me, hung with green weeds, forsaken of the sea, dark tunnels appeared, and secret narrow passages that were clamped and barred. From these at last the stealthy rats came down to nibble me away, and my soul rejoiced thereat and believed that he would be free perforce from the accursed bones to which burial was refused. Very soon the rats ran away a little space and whispered among themselves. They never came any more. When I found that I was accursed even among the rats I tried to weep again. Then the tide came swinging back and covered the dreadful mud, and hid the desolate houses, and soothed the forgotten things, and my soul had ease for a while in the sepulture of the sea. And then the tide forsook me again. To and fro it came about me for many years. Then the County Council found me, and gave me decent burial. It was the first grave that I had ever slept in. That very night my friends came for me. They dug me up and put me back again in the shallow hold in the mud. Again and again through the years my bones found burial, but always behind the funeral lurked one of those terrible men who, as soon as night fell, came and dug them up and carried them back again to the hole in the mud. And then one day the last of those men died who once had done to me this terrible thing. I heard his soul go over the river at sunset. A few weeks afterwards I was found once more, and once more taken out of that restless place and given deep burial in sacred ground, where my soul hoped that it should rest. Almost at once men came with cloaks and tapers to give me back to the mud, for the thing had become a tradition and a rite. And all the forsaken things mocked me in their dumb hearts when they saw me carried back, for they were jealous of me because I had left the mud. It must be remembered that I could not weep. And the years went by seawards where the black barges go, and the great derelict centuries became lost at sea, and still I lay there without any cause to hope, and daring not to hope without a cause, because of the terrible envy and the anger of the things that could drift no more. Once a great storm rode up, even as far as London, out of the sea from the South; and he came curving into the river with the fierce East wind. And he was mightier than the dreary tides, and went with great leaps over the listless mud. And all the sad forgotten things rejoiced, and mingled with things that were haughtier than they, and rode once more amongst the lordly shipping that was driven up and down. And out of their hideous home he took my bones, never again, I hoped, to be vexed with the ebb and flow. And with the fall of the tide he went riding down the river and turned to the southwards, and so went to his home. And my bones he scattered among many isles and along the shores of happy alien mainlands. And for a moment, while they were far asunder, my soul was almost free. Then there arose, at the will of the moon, the assiduous flow of the tide, and it undid at once the work of the ebb, and gathered my bones from the marge of sunny isles, and gleaned them all along the mainland's shores, and went rocking northwards till it came to the mouth of the Thames, and there turned westwards its relentless face, and so went up the river and came to the hole in the mud, and into it dropped my bones; and partly the mud covered them, and partly it left them white, for the mud cares not for its forsaken things. Then the ebb came, and I saw the dead eyes of the houses and the jealousy of the other forgotten things that the storm had not carried thence. And some more centuries passed over the ebb and flow and over the loneliness of things for gotten. And I lay there all the while in the careless grip of the mud, never wholly covered, yet never able to go free, and I longed for the great caress of the warm Earth or the comfortable lap of the Sea. Sometimes men found my bones and buried them, but the tradition never died, and my friends' successors always brought them back. At last the barges went no more, and there were fewer lights; shaped timbers no longer floated down the fairway, and there came instead old wind-uprooted trees in all their natural simplicity. At last I was aware that somewhere near me a blade of grass was growing, and the moss began to appear all over the dead houses. One day some thistledown went drifting over the river. For some years I watched these signs attentively, until I became certain that London was passing away. Then I hoped once more, and all along both banks of the river there was anger among the lost things that anything should dare to hope upon the forsaken mud. Gradually the horrible houses crumbled, until the poor dead things that never had had life got decent burial among the weeds and moss. At last the may appeared and the convolvulus. Finally, the wild rose stood up over mounds that had been wharves and warehouses. Then I knew that the cause of Nature had triumphed, and London had passed away. The last man in London came to the wall by the river, in an ancient cloak that was one of those that once my friends had worn, and peered over the edge to see that I still was there. Then he went, and I never saw men again: they had passed away with London. A few days after the last man had gone the birds came into London, all the birds that sing. When they first saws me they all looked sideways at me, then they went away a little and spoke among themselves. "He only sinned against Man," they said; "it is not our quarrel." "Let us be kind to him," they said. Then they hopped nearer me and began to sing. It was the time of the rising of the dawn, and from both banks of the river, and from the sky, and from the thickets that were once the streets, hundreds of birds were singing. As the light increased the birds sang more and more; they grew thicker and thicker in the air above my head, till there were thousands of them singing there, and then millions, and at last I could see nothing but a host of flickering wings with the sunlight on them, and little gaps of sky. 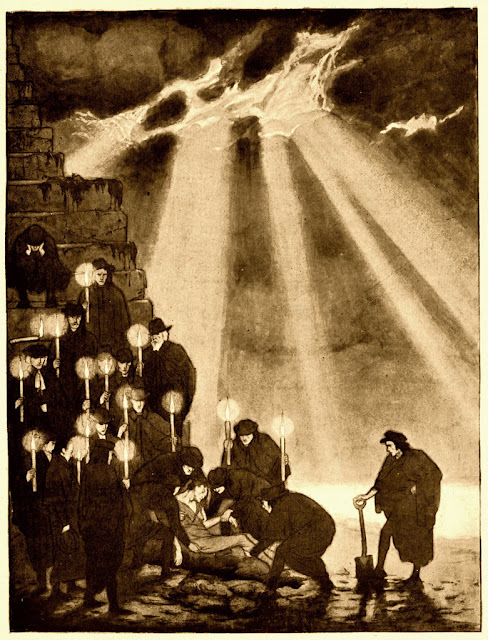 Then when there was nothing to be heard in London but the myriad notes of that exultant song, my soul rose up from the bones in the hole in the mud and began to climb heavenwards. And it seemed that a lane-way opened amongst the wings of the birds, and it went up and up, and one of the smaller gates of Paradise stood ajar at the end of it. And then I knew by a sign that the mud should receive me no more, for suddenly I found that I could weep. At this moment I opened my eyes in bed in a house in London, and outside some sparrows were twittering in a tree in the light of the radiant morning; and there were tears still wet upon my face, for one's restraint is feeble while one sleeps. But I arose and opened the window wide, and stretching my hands out over the little garden, I blessed the birds whose song had woken me up from the troubled and terrible centuries of my dream. Markest thou what sentry is seated in the doorway? what shape guards the threshold? 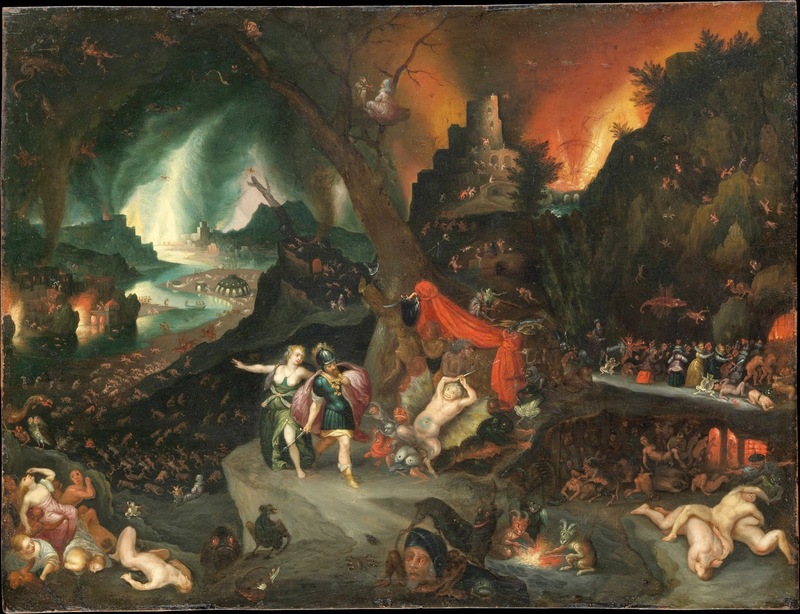 Jan Brueghel the Younger, Aeneus and the Sybil in the Underworld, 1630's. Aeneas looks swiftly back, and sees beneath the cliff on the left hand a wide city, girt with a triple wall and encircled by a racing river of boiling flame, Tartarean Phlegethon, that echoes over its rolling rocks. In front is the gate, huge and pillared with solid adamant, that no warring force of men nor the very habitants of heaven may avail to overthrow; it stands up a tower of iron, and Tisiphone sitting girt in bloodstained pall keeps sleepless watch at the entry by night and day. Hence moans are heard and fierce lashes resound, with the clank of iron and dragging chains. Aeneas stopped and hung dismayed at the tumult. The Aeneid of Virgil, translated by J.W. Mackail, M.A., London, MacMillan and Co., 1885.